This year’s winner of the Association of Polelathe Turners Woodland Heritage Trophy was Katie Abbott with her stunning Yew and Burr elm chair. Wade Muggleton went along to discover how Katie made the journey from School Teacher to Champion chair maker. To visit Katie and Nick Abbott in the Essex countryside is to come across two people who clearly love what they do, their house is full of beautiful furniture, their kitchen brims with treen and they even served me scones and jam on wooden plates. 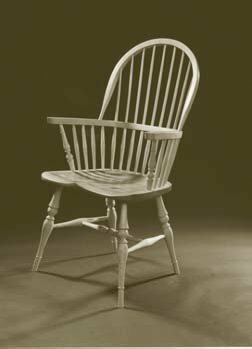 The story of how they came to make Windsor chairs is in many ways a story of modern life, a story of families, the rat race, ill health and career changes that all in turn, lead to owning a wood, working wood and in the end finding contentment. Living in a town house with a small garden and four children was the motivation for Nick and Katie to buy Slough House wood. In 1980 they purchased the 25 acres of mixed beech, chestnut oak and conifer, largely as a family resource and an extended garden, albeit one 20 miles down the road. It was a place to go and let off steam for family camping weekends, for tree climbing and sourcing firewood. The idea had developed three years previously but it took the coming and going of three summers to find the right wood. Having enjoyed dabbling in the woods, it was in 1985 that they both attended Mike Abbott’s (no relation) first ever Greenwood course. Having had their eyes opened to the possibility of wood craft they then made an annual pilgrimage to Mike and his courses, making a chair and on one course, a pole lathe to take home. Katie a school teacher with a specialism in dyslexia training took to woodwork, in particularly the pole lathe, like the proverbial duck to water and soon began turning out a range of treadle driven quality turning. This period of enthusiastic hobby woodworking, coincided with other life changing circumstances, Nick a partner in a law firm was suffering ill health that culminated in a heart bypass op and a decision to get out of the rat race while he could. So in ’93 he took early retirement, unsure of where the pennies were going to come from. He and Katie decided to take the dangerous plunge of turning a hobby into a business and try making chairs for a living. Now 12 years later they are firmly established as one of the country’s leading makers of beautiful Windsor’s. Working mostly in local English Ash which they source from firewood merchants, along with Oak and Chestnut from their own wood, some Beech, a little Sycamore, some Lacewood, often used as an Elm substitute and the odd bit of Fruitwood, they embody the use of quality home grown timber. Their clients range from well-to-do professionals to other crafts folk and their chairs have travelled as far as New Zealand and Australia. A specialist line of Nick and Katie’s is children’s chairs, often with names carved in the back, one client has been a repeat customer purchasing one each for her five grandchildren. They now virtually do no advertising, attracting many clients as a result of word of mouth recommendations. They are part of a self help group called Cambridge open studios who promote crafts people to open their workshops and galleries on certain days of the year. Quality, not quantity and targeting the right clients are the key, for as Nick says, “whilst an open day may yield only 30 visitors those thirty can often result in 15 orders.” In addition they are members of the Essex Crafts Guild, a network of local artisans working in a range of mediums. Equally interesting is the way they work so harmoniously as a team. Katie does all the turning on a pole lathe and most of the marking out, whilst Nick tends to do the seats and the steam bending. They then come together to jointly assemble the chairs/stools. “We enjoy working together, that is one of the attractions of doing it” they say. In so many ways what Nick and Katie have done embodies the aims of Woodland Heritage, looking after their own woodland, working in quality local timber and looking for alternative uses and added value for timber that the market tells us has little or no value.